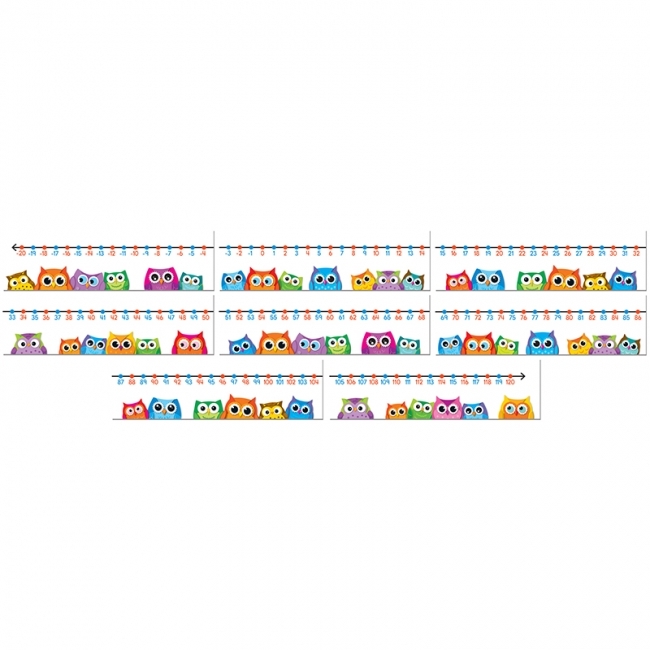 Support the development of mathematical skills with the eye-catching, contemporary Colorful Owls Number Line Mini Bulletin Board. Display this functional and vivid mini bulletin board set in the classroom as a way to reinforce critical counting and number recognition skills. 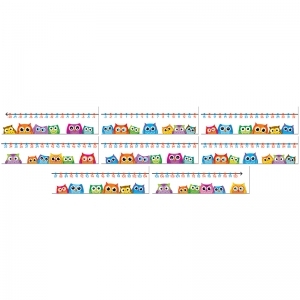 The Colorful Owls Number Line Mini Bulletin Board includes 8 number line strips, 6" x 21" each, with alternating colors for odd and even numbers -20 through 120, and a resource guide. Colorful Owls are back and ready to help teachers expand contemporary decorative themes into their curriculum! Color and decorations in the classroom provide a clear message to students about the environment and culture of the classroom. The playful and vibrant Colorful Owls design helps teachers create a positive environment that promotes creativity, enthusiasm and productivity. This Numbers 0-30 mini bulletin board features a rainbow of colors in paint chip style making a simple but colorful display. Each number card expresses the number in three different ways: written form, numeral form and 10-frame form. The ombre color accents of these paint chip number cards distinguishes each form of the number. 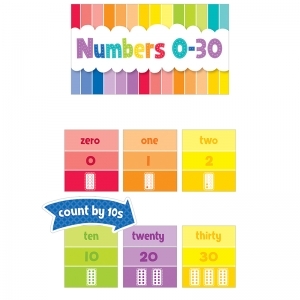 Use these manipulative pieces individually to reinforce numeral—number recognition and word form correspondence or post them side by side as a number line reference display. In addition to the number cards, the set includes color-coded skip counting prompt arrows (2s, 5s, 10s) and 24 skip counting star pieces. Set also includes a Numbers 0-30 title sign, 2 blank 10 frames, and a Counting Numbers poem. This set gives students a fun way to practice basic counting and math skills including odd and even numbers and counting by 2s, 5s, and 10s. 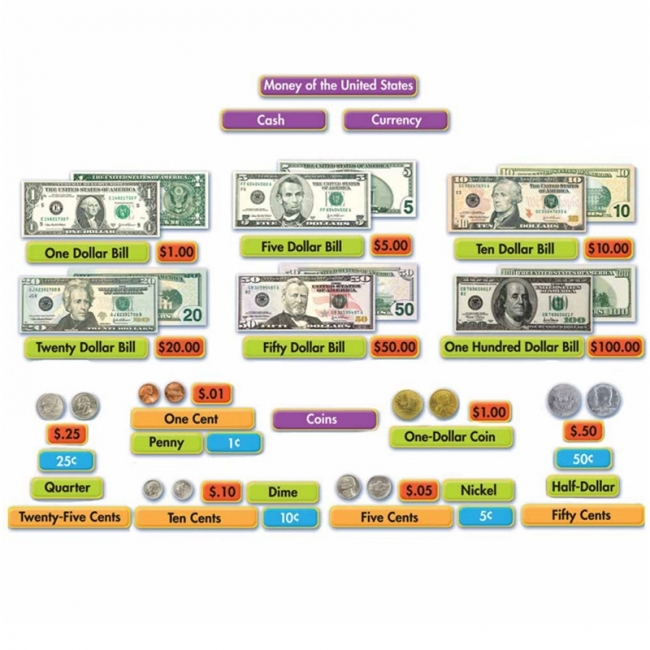 Each number card measures approximately 5.25" x 6" Total number line length is approximately 13.5' Set includes 62 pieces in total. Also contains an activity guide with lesson and display ideas and related learning standards. 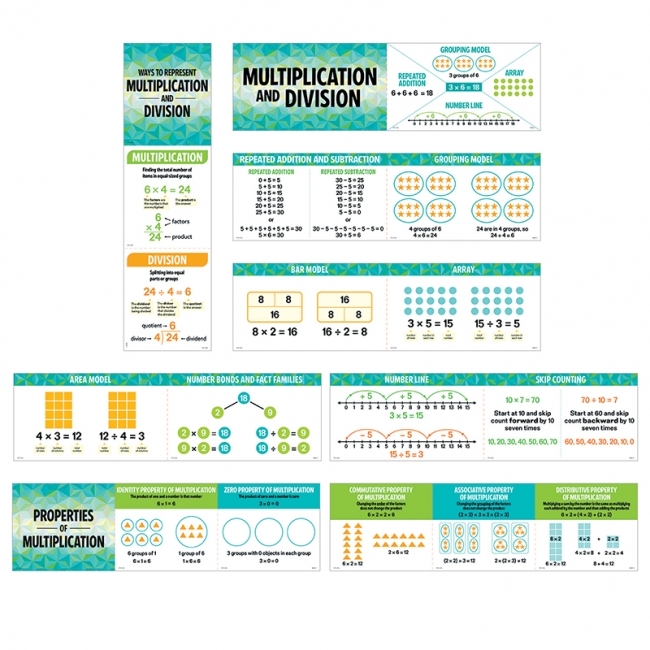 Use this 18-piece mini bulletin board to help students grasp the concepts of multiplication and division, learn different ways to represent multiplication and division, and comprehend the five basic properties of multiplication. 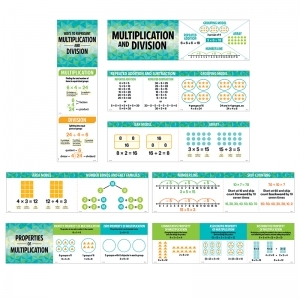 Use these pieces to introduce a multiplication or division concept or display them on a bulletin board or in a learning center as a reference. Pieces range in size from 7" x 6" to 10.5" x 6." 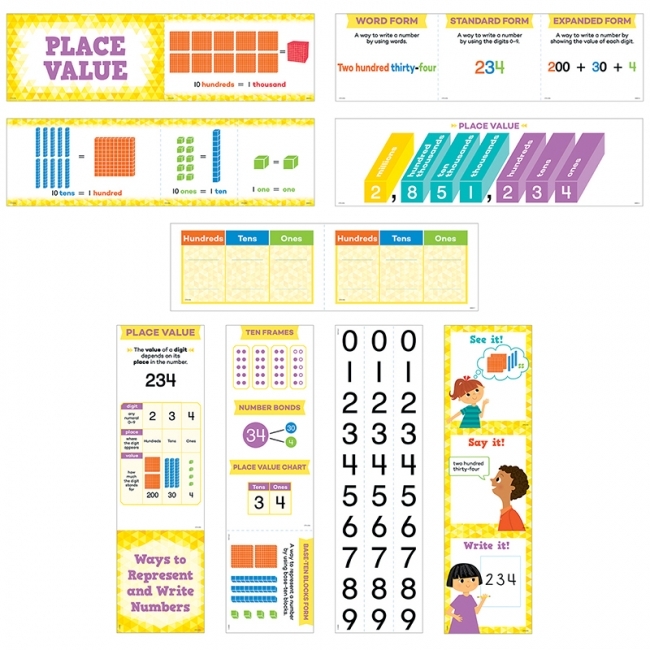 Help students understand the meaning of the base-ten number system, learn different ways to represent and write numbers, and practice composing and decomposing numbers to 999 with this vibrant 21-piece mini bulletin board. Use the place value number slider to create numbers up to 999 for classroom instruction or student activities. 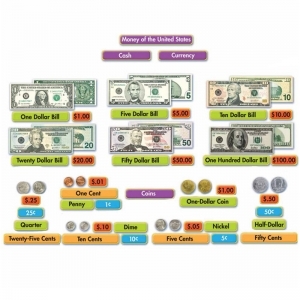 Display the reference pieces in a pocket chart, on a bulletin board, or in a learning center. 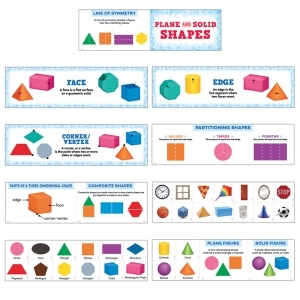 Pieces range in size from 5.25" x 6" to 21" x 8"
Place value number slider measures 10.5" x 21"
Introduce students to plane and solid shapes with the 40 pieces in this mini bulletin board set. 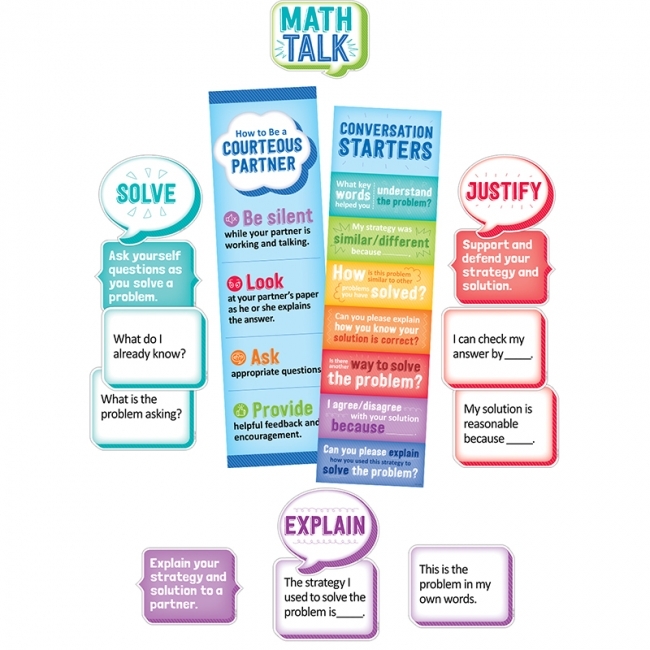 Perfectly sized for use in a pocket chart or on a bulletin board, the mini posters are ideal for reinforcing important geometry concepts and academic vocabulary. 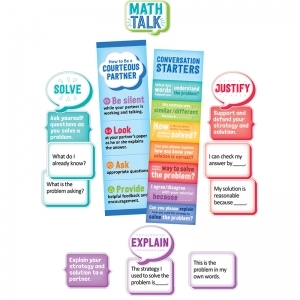 When used in a math learning center, the geometric shapes, cards, and photographic images of real-world objects are perfect for helping students make connections between geometric shapes and shapes in the world around them. Perfect for grades K—2. Pieces range in size from 3 ½?x 3? to 21?x 6? 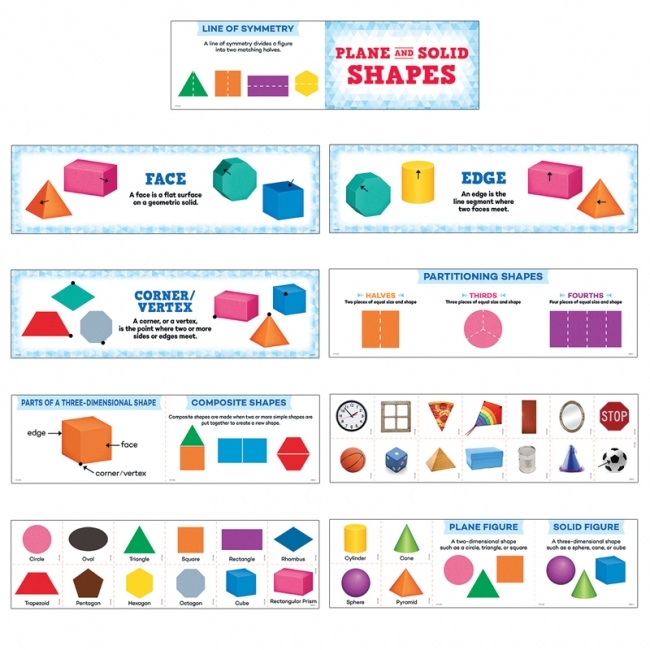 Tip: Students can use the 2-D and 3-D shape cards to help them identify shapes in the classroom during a shape scavenger hunt. Create a matching game using the shape cards and the real-world object cards.